Zeus, the chief god in Greek mythology, has sent two eagles flying across the world to find its center. He released both of them at the same time, one from the East and the other one from the West, moving at equal speed. At the GPS location where the eagles’ paths crossed, Zeus threw a Stone from the sky, and it fell in – Delphi. This is how the center of the world (well, at least the center of the ancient Greek world) was determined. Later, the navel of Gaia (Grandmother Earth) will become famous for the Oracle of Delphi. It will be the place where Pythia, the Sybil priestess, mysteriously shaped personal and collective histories of the Mediterranean. It will also get known for Pythian Games, precursors of the modern Olympics. The Stone thrown by the eagles may have been forgotten, but this hasn’t made it any less real! The painting of the nymph in Kastalia Hotel in Delphi almost became the site of the worship! “Before visiting the archeological site, you need to go to the Kastalian Spring and drink the water”, I got the instructions as soon as I checked-in at the Hotel Kastalia in Delphi. Warmly welcomed by the receptionist Dora, I’ve learned that the spring is considered to be sacred. It purifies the visitors before consulting the oracle. Pythia supposedly lived by the spring and used its waters for inspiration when giving prophecies. The spring was named after the prophetic nymph Kastalia (Castalia). Her image or sculpture you will find neither at the Delphi Archeological Site nor the Delphi Archeological Museum. The only place you can envisage this powerful entity is the lobby of Hotel Kastalia. The painting of the nymph, visible from the street, attracts the pedestrians passing by. Dora has even seen some worshippers bowing in front of it! I passed on the offer of drinking from the spring for the time being and consoled with a Greek beer on the hotel terrace instead. The views of the Gulf of Corinth, Ionian Sea backdrop, and Pleistos Valley, filled with olive trees, explained why ancient Greeks considered this part of Earth to be divine. Kastalian Spring is located just between the two significant archeological sites – the Temple of Apollo and the Temple of Athena Pronaia. The first one might be more famous, as it dominates a much larger archeological area which includes even the Amphitheater and the Stadium. But the symbol of Delphi today is Tholos – the structure that makes Athena Pronaia Temple at least visually recognizable. Tholos is a distinctive circular building constructed around 380 BC. Only three of the twenty Doric columns have been restored. In the inner circle of this masterpiece structure, there were ten Corinthian columns. Their absence today did not affect its instagrammability. It is the most popular place to take photographs in Delphi. In addition, the Sanctuary of Athena Pronaia includes the remains of the three temple buildings dedicated to this goddess of wisdom. The oldest one might have been constructed 28 centuries ago! 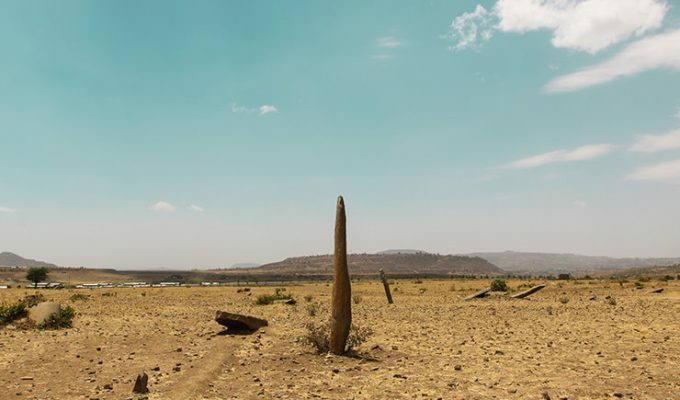 If you are interested in ancient civilizations, make sure to read our article on the fascinating heritage of Axumite civilization in Ethiopia. They have raised the world’s largest monolithic monuments! Delphi Archeological Site is centered around the Temple of Apollo. It was rebuilt several times in history, due to events such as fire or earthquake. While the archeologists traced the erection of the first building to 7th century BC, the mythologists know this is not true. Older Apollo’s sanctuaries were supposedly built of laurel, bee’s wax, feathers and bronze! The foundations we see today, together with several Doric columns, belong to the “youngest” of the temples – the one constructed in 320 BC. The Temple of Apollo was the place where the sanctuary housed the omphalos (navel), the mythical stone that the eagles of Zeus dropped after their encounter. In the hearth of the temple, an eternal flame was burning. The famous Delphic maxim “Know thyself”, attributed to Apollo and given through the oracle, was carved into the temple walls. Pythia was the biggest influencer of her times, and she didn’t even have an Instagram account! 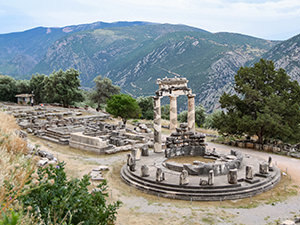 However, the most famous part of the Sanctuary of Apollo in Delphi was the Delphic Oracle, the seat of Pythia. She was an old priestess who would sit on a tripod seat in an enclosed sanctum. 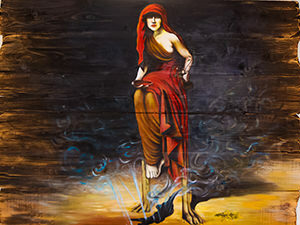 Infused with inspiration coming from an opening in the earth or chasm, she would fall into a trance. Possessed by Apollo, she would then mumble, and the other priests would translate her ecstatic mutterings into – prophecies. The whole ancient classical world was coming to Delphi to consult this reader of the fumes, before taking important decisions. What an influencer, in the times when social networks worked offline! The oracle temple was at its peak between the sixth and fourth century BC. Pythia’s successful prophecies motivated many rulers and ordinary people to come for advice. Many expressed their gratitude by giving gifts. The Sanctuary of Apollo became the depository of votive statues and smaller artworks kept in the treasuries. They were the expression of appreciation for the victories in the battles fought after the oracle’s advice. Often, the winners would bring one-tenth of the spoils of the battle (a tithe) to Apollo as an offering. Athenian Treasury, one of the restored buildings, housed the loot from the famous Battle of Marathon in 490 BC. The structure’s pertinence lies in its walls as well – they bear the first inscriptions of the musical notes in history! Delphi Archeological Museum is the new home of the artifacts that started to be discovered only in 1893, after the medieval village of Kastri was relocated from the site. 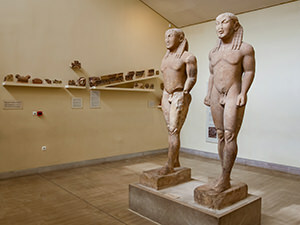 The statue collection includes the depiction of the famous athletes such as twin brothers Cleobis and Biton. These marble kouros date to 580 BC. The large marble Sphynx from Naxos or the bronze Charioteer with still preserved eyelashes, are equally impressive. Then there is the statue of Antinous, the lover of the Roman Emperor Hadrian who frequently consulted the oracle in the 2nd century AD. Two Delphi buildings served for the Pythian Games. The Theater, which could accommodate up to 4.500 spectators, was the venue for theatrical and musical contests. The Stadium, built to accept 6.500 people, was the place of the athletic competitions – the precursors of the Olympic Games. Delphi is located in Central Greece, at an altitude of 550 meters, on the steep slope of Mount Parnassos. It is 180 kilometers away from Athens, in the north-east direction. There are direct bus connections and the ride takes about 3,5 hours. Where to stay in Delphi? Kastalia Boutique Hotel is located five minutes away from the major sites of interest, and therefore represents the perfect base for exploring the ancient Delphi. Its renovated and modernly equipped rooms provide an upgraded experience of relaxation that one will need, especially if planning to hike in Delphi’s beautiful surrounding. Kastalia Hotel is not just an adequate answer to the question “where to stay in Delphi”, but also to the question “where to eat in Delphi”! 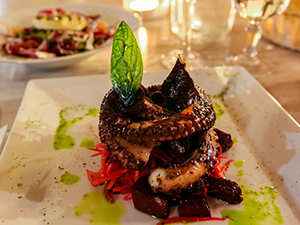 Elia Restaurant, at the hotel’s ground floor, serves generous portions of Greek food with a modern touch. I especially enjoyed their crunchy nut-crusted kefalotyri, chicken in orange, octopus with julienne veggetables, and genuinely fulfilling desserts! Kastalia Boutique Hotel is managed by the former pilot and flight attendant, people who understand what traveling is all about. While the bathroom and balcony space could be a bit limited, the rooms provide all basic needs one would expect from the 4-star property. When all of it is garnished with warm hospitality, Kastalia Hotel turns out as a pleasant, welcoming and recommendable Delphi accommodation option. If the Christians wouldn’t have destroyed the Oracle of Delphi, maybe today we wouldn’t be saying that “all roads lead to Rome”. 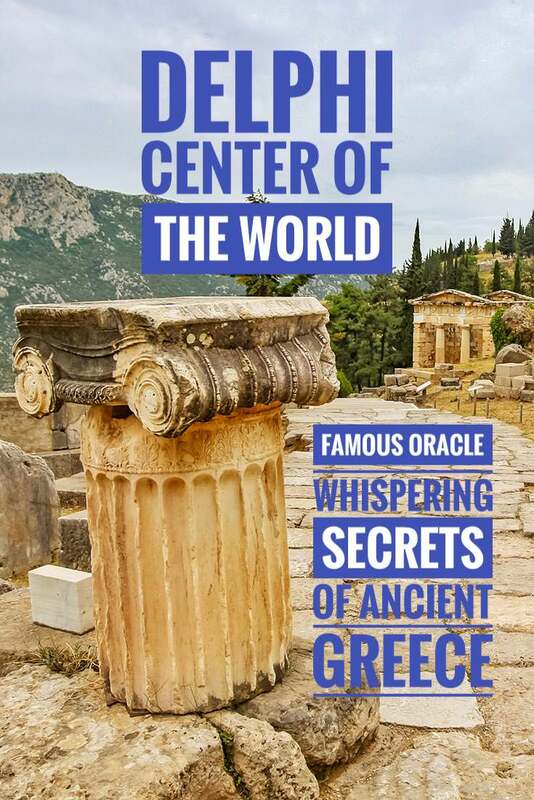 In the period of the Oracle, all roads led to – Delphi. The Roman emperor Theodosius I shut it down in the late fourth century following the Christian attempts to wipe out all traces of Paganism and to make more room for their own temples and “one and only” god. Even if historical events extinguished the legendary society that introduced the prophecy into politics, the events such as earthquakes protected our knowledge of the ancient past. 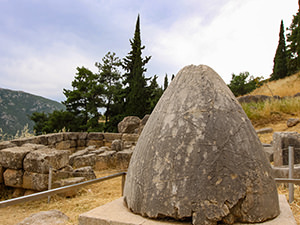 The omphalos dropped by the eagles still exists in Delphi. This is the navel of the Earth. 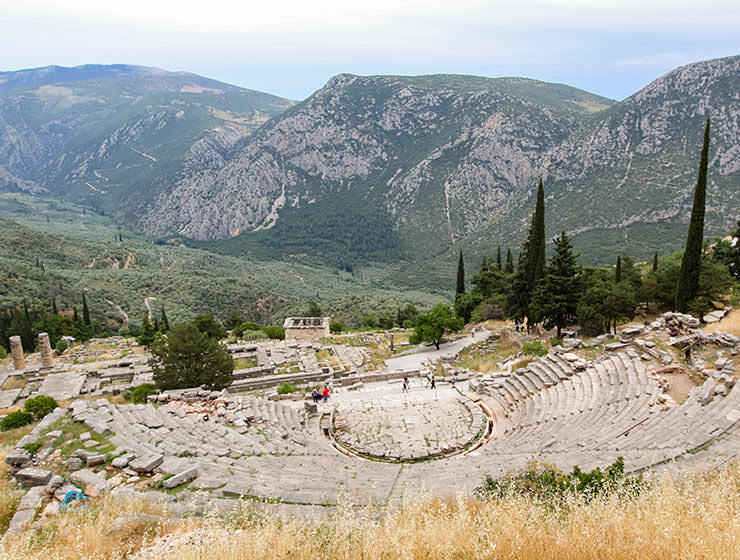 Are you ready to experience Delphi, the center of the world? Still searching for a place to stay in Delphi? Disclosure: My stay at the Kastalia Boutique Hotel was complimentary, but all opinions are my own. 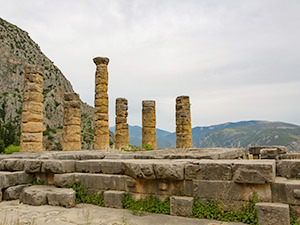 Delphi is a real gem full of ancient history, archaeology and legends. I love the legend about the two eagles and the stone dropped by Zeus, which became a place of worship and the center of the ancient world. A temple dedicated to the goddess of wisdom, which was built twenty eight centuries ago, would be very intriguing to see. Awesome destination. Thank you for sharing! I hope you get to see it yourself! You can even touch the stone dropped by Zeus. Apparently, some people feel the special energy of the place! Delphi sounds amazing, and the history is fascinating! I’m hoping to make it over to Greece later this year and will definitely be adding it to my list! Great to hear it, Hanna! Definitely let us know how it was! Have a nice time in Greece! I am here for a month and a half now, and still can’t stop discovering new fascinating things!